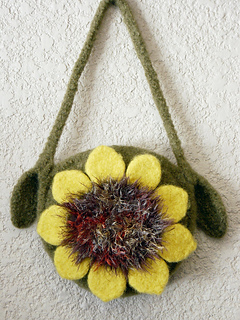 Lg: 11" x 11", Sm: 8" x 8"
Easy to knit and assemble, this felted bag requires no sewing. Pieces are trimmed and joined with applied I-cord leaving only tails to weave in. Bright as a summer’s day, these bags are great for eyelash stash reduction. Who doesn’t have 10-20 yds of eyelash yarn lurking in the leftovers? One hank of WoolPak in main color will make two bags, regardless of size. 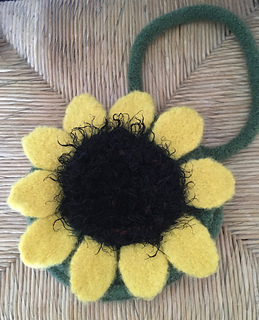 Flower petals require 60 yds for large bag, 30 for small. 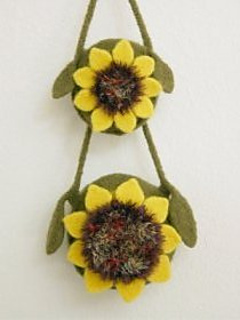 Flower center requires 20 yds wool & eyelash for large, 10 yds both for small.